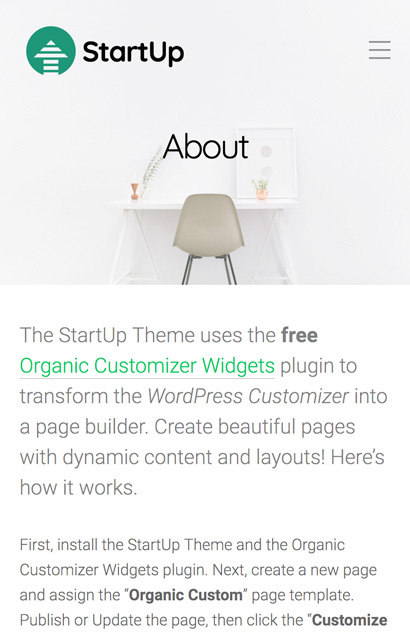 StartUp utilizes custom widgets to transform the WordPress Customizer into a page builder. Start using StartUp to create dynamic sites faster and easier! 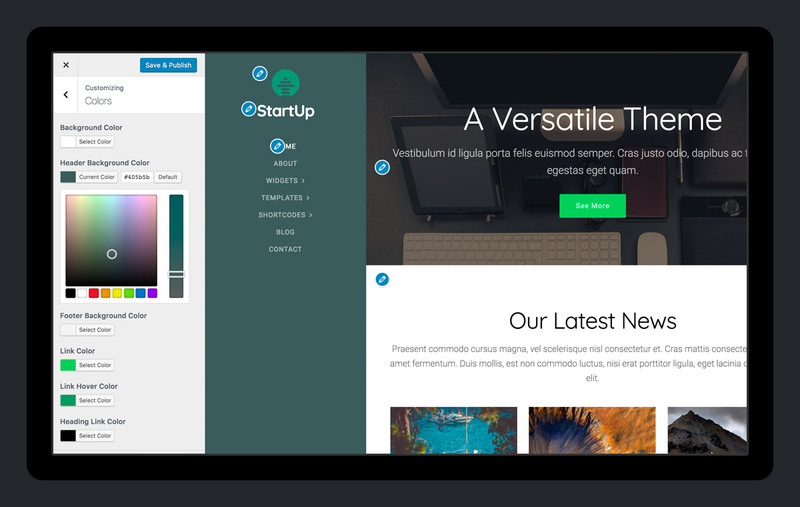 StartUp is our answer to WordPress multipurpose themes and page builders. The theme uses Organic Builder Widgets to transform the core WordPress Customizer into a page builder using custom widgets as content sections. 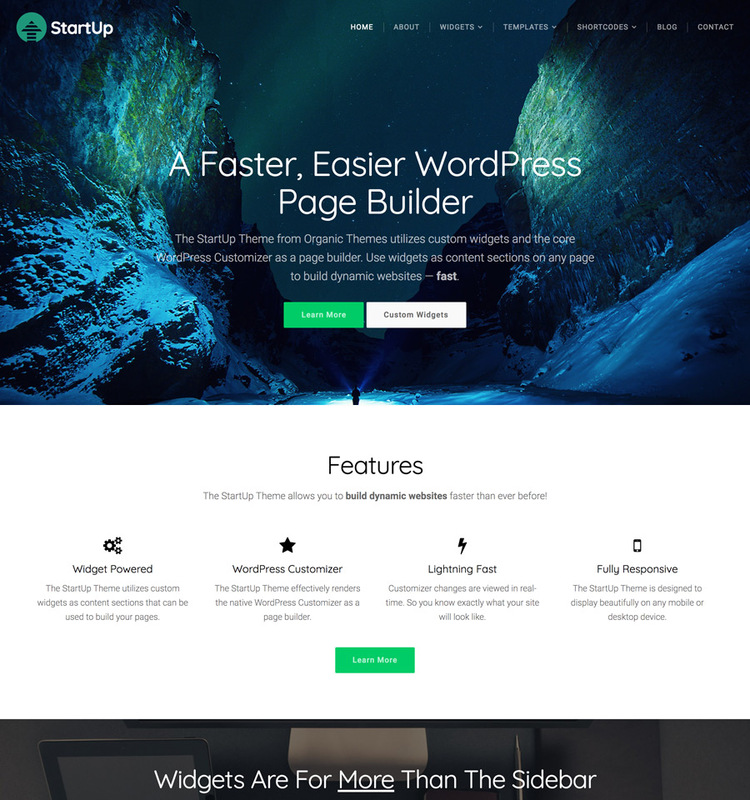 The StartUp Theme differs from other WordPress multipurpose themes and page builders. It utilizes the core WordPress Customizer and native widget functionality. By contrast, other solutions often use a plethora of shortcodes, proprietary code and create confusing interfaces within the WordPress dashboard. With StartUp, all changes to your site can be made in real-time within the familiar Customizer environment. Additionally, the lack of bulky proprietary code results in a much faster performing website which in turn benefits your SEO. Using the StartUp Theme is simple. The learning curve is virtually non-existent since you’re working within the familiar WordPress Customizer interface. Rather than moving around empty placeholders for content, you can visualize exactly what your website will look like in real-time within the preview window. Additionally, StartUp is compatible with the One Click Demo Import plugin. So you can import all the content, widgets and customizer settings from any StartUp demo to use as a guide. After importing the content, your website will immediately appear exactly like the theme demo without any additional steps. Hero – A full browser height section with featured text and a call to action. Blog – Display a section of blog posts from any category in a chosen layout. Content Slideshow – A full width slideshow of featured posts with background images. Feature List – A list of features with icons displayed in multiple column layouts. Portfolio – A section of posts displayed as portfolio images in a masonry layout. Subpage – Display any page content as a section within another page or use custom content. Team – A section of team members from a selected post category. 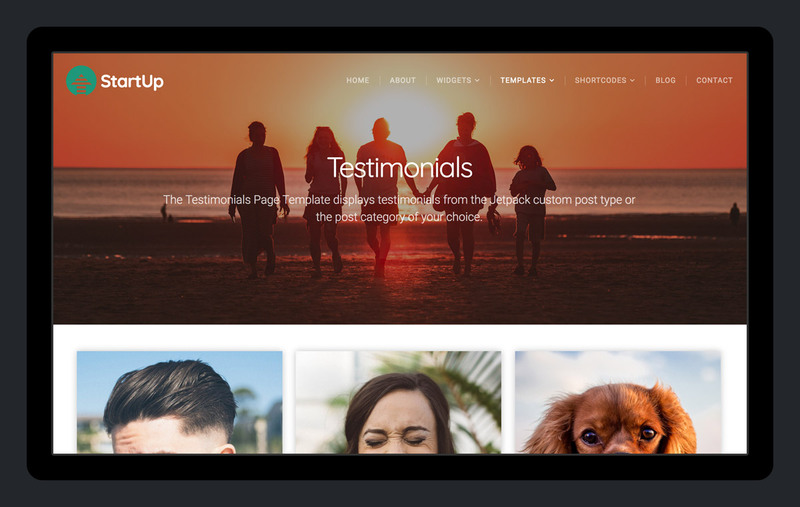 Testimonials – A slideshow of testimonials from a selected category or custom post type. Profile – A personal profile with an image, bio and social media links. Pricing Table – A section of pricing tables with a featured list and link to purchase. Featured Content – Custom content that can be grouped together with other featured content widgets. StartUp is compatible with the popular Gravity Forms plugin for creating dynamic contact forms. The theme also works seamlessly with Jetpack. It includes Jetpack custom post types for displaying portfolio projects and testimonials. Additionally, StartUp is compatible with WooCommerce. So you can create a shop and sell products on your site with ease. 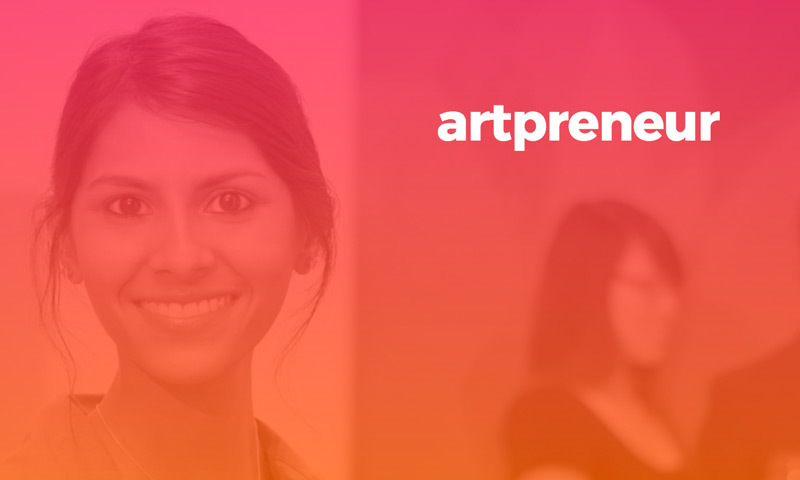 Get started with StartUp today! Use widgets to display a variety of content sections. Several page templates are included with StartUp. Change the layout and colors within the Customizer. 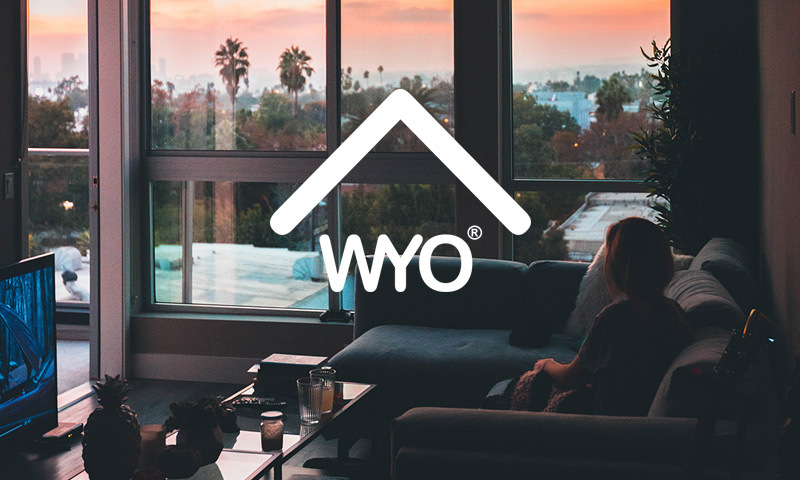 Customers that have built awesome WordPress websites using the StartUp Theme. Start building your website with the StartUp Theme!